It is always exciting when two musicians get together to improvise in real time. Violinist India Cooke and bassist Joelle Leandre performed live in Denver during an academic conference called "Improvisation and Identity: Discovering Self and Community in a Trans-Cultural Age," and their duet was the perfect choice to reflect the nature of the proceedings musically. Spontaneously composed and improvised, their performance is suite called Journey, broken for the sake of programming into six sections. The music develops like the blooming of a flower, beginning slowly and tentatively, with the performers trading ideas with swirls of bowed and plucked music moving forward in a dexterous and very free nature. 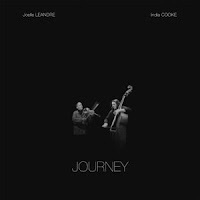 The music draws upon free jazz, modern classical and other genres and Leander and Cooke meld their own unique musical visions into one as they develop a musical conversation that involves quick give and take, gentle pauses and the occasional argument. This was a fascinating and unusual performance that sounds like little else as the musicians stake out common ground and their own musical identity. Journey - NoBusiness Records.